During past few days, 16-18th March 2017, the 9th Synod session of the Church of Bangladesh has been concluded with a total 72 delegates attended, representing Church and all institutions those two Church of Bangladesh runs under existing two dioceses. Theme this session was – “Now you are Christ’s body, and individually members of it”- 1st Corinthians 12:27. Moderator Bishop Paul S Sarkar presented a paper on this theme while deputy moderator Bishop Samuel S Mankhin presided over the session. 29 reports including 2 diocese, all Church-run institutions were presented in this meeting. A new Synod committee was elected for next three years (2017-2019) and Dr. James Tejosh Das became the honorary Secretary while Mr. Lawrence Mondol, the honorary Treasurer. On February 12, 2017 at the Helmel meeting Mr. Richard Mardy was been ordained at Babuldang church. Honorable Bishop Samuel S. Mankhin ordained him with the co-operation of the Priests from Rajshahi Deanery. Brother Erick from Taize community the preacher in the church service, later newly ordained Deacon was welcomed. Mr. Richard Uttam Biswas and Mr. Manik Baroi also ordained at ‘BORO SOVHA’ of Jobarpar Deanery on February 12, 2017 at Kandi. The ordination was conducted by the honorable Bishop Paul Shishir Sarker of Dhaka Diocese; and was assisted by the Priests. Rev. Shourabh Pholia preaches from the Holy Bible, later a warm receptions were given to the newly ordained Deacons. Mr. Dipok Ujjal Biswas and Mr. Peter Mondol were ordained at Christ Church, Karpasdanga on February 19, 2017. Honorable Moderator & Bishop of Dhaka Paul S. Sarker and deputy Moderator & Bishop of Kushtia, Bishop S. Mankhin conducted the ordination service jointly; other Priests present also assisted while Rev. Simson Mazumder preaches. Later a reception was given to the ordained Deacons. By God’s grace Church of Bangladesh (CoB) has elected Revd Shourabh Pholia the Bishop for it’s third diocese – Barisal. On 24th February Bishop’s Electoral Board comprising laities and all clergy of Church of Bangladesh gathered in a retreat at CoB Conference Centre at Savar, Dhaka and later both the houses voted to elect the Bishop. The retreat led by Fr. Benjamin Costa, C.S.C, Vice Chancellor (Acting) of Notre Dame University. Br. Guillaume from Taize Community and Sr. Agnes from Christo Sevika Sangha assisted Bishop Paul Shishir Sarker, Moderator of CoB to conduct the election. It is a historical event for the Church of Bangladesh with lots of hopes to expedite the way of creating God’s Kingdom. Revd Shourabh, the Bishop-elect did his Bachelor in Science from B.L. College, Bangladesh in 1992. Later he obtained Bachelor Degree in Divinity (1993-97) and Masters in Missiology (2005) from the Senate of Serampore College (University), India and from Gloucestershire University, UK respectively. He ordained in 1997 as Deacon and in 1998 as Priest of CoB. In his journey with CoB he took different responsibilities in the Church Ministries. For last couple of years he has been serving as General Secretary of the Bangladesh Bible Society on deputation. “It is God’s grace which I have received through you all. Please continue your prayers for me so that I can fulfill and follow the God’s will. I humbly submit myself to His call to serve our Church and the society. In this journey I need your prayers, blessings and support.” Said by the newly Bishop-elect Revd Shourabh Pholia. Let us continue to pray for Revd Shourabh Pholia and his wife Suchitra Behera and their only daughter Shatabdi Pholia. Let us uphold them to our Lord so that they can be an ideal family, and Rev. Pholia, may become such a Shepherd who could bring his flock under God’s grace and care. The Moderator of Church of Bangladesh blessed the newly constructed building of Christo Sebika Sangha at Jobarpar Sisterhood, unveiling the cover of the stone plaque. After that the Bishop Paul S Sarker and Moderator of Church of Bangladesh, the Roman Catholic Church Barisal Diocesan Bishop Subrata and the Father of Oxford Mission Barisal cut the ribbon and entered into the house. Later, the Bishop administered a devotion service on this occasion. During the blessing of the new building all the sisters, all priests of the deanery, distinguished guests and few leaders of the community were present in the programme. The host sisters offered a feast in the lunchtime. The little girls of the Shishu Jishu Hostel organised a cultural programme and performed. However, the new building blessing ceremony was begun with the special Eucharist service at St. Mary’s Church in Jobarpar parish. The service was conducted by the Bishop Paul S Sarker. Moreover, Rev Dr. Albert S Walter, Principal of St Andrew’s Theological College gave sermon. 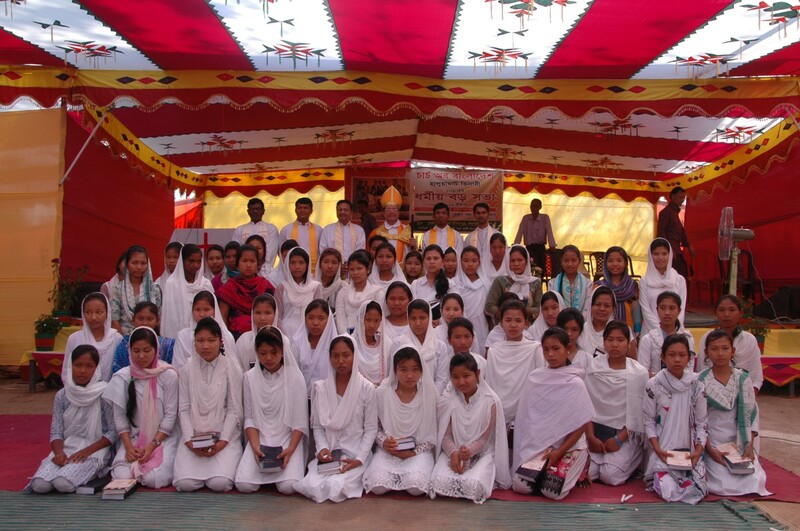 Bishop Paul S. Sarker led the sacrament of confirmation for 100 candidates at St. Mary’s Church in Haluaghat on 11 March 2016. The youth came from nearby parishes, and the priests of the deanery were present to assist with the confirmation service and Holy Communion. Bishop Sarker explained that confirmation is a renewal of baptism, so people should follow the instructions and advice of baptism. The newly confirmed communicants should obey Christ and the promises of baptism for new life. Moreover, those who have been confirmed in the past should recall these promises this very day.